A discussion of five common "tells" -- both physical and verbal -- that turn up at the poker tables. Making eye contact, acting quickly, trembling hands, table talk -- what do these poker "tells" mean? Players who are relatively new to no-limit hold'em sometimes overvalue the importance of "tells" in poker. By tells we're referring to those actions, either physical or verbal, players make at the table that might give away information about the strength of their hands. In any live poker game, especially at the lower limits, it isn't uncommon to see players revealing information via such tells without being aware they are doing so. Players also will deliberately act in certain ways or say certain things to try to deceive their opponents, and thus might give away information to others who are able to see through such performances. However, new players are probably better off not worrying too much about deciphering other players' tells, but instead focusing on other aspects of poker strategy while trying to minimize their own tells. In fact, when we offer the following list of "five common poker tells to look for," instead of looking for them in others, you might first look at yourself and decide whether or not others might be witnessing you give off these tells. Then, after you've become more comfortable knowing that you aren't giving anything away, you might begin taking notice of what others are doing. Generally speaking, players who look squarely into your eyes during a hand are conveying strength. Having a big hand often makes players more relaxed, and when they are more relaxed they are more likely to make eye contact than not. Players who are weak or bluffing are usually less comfortable about the situation, and won't be so ready to look directly at you. The flip side of this are players looking away from you or obviously avoiding eye contact, which often will represent relative weakness. Especially if they have just bet as a bluff, players will deliberately avoid engaging their opponent by looking at them. As with all tells, though, in order from them to be reliable, they have to exist as part of a larger pattern of behaviors that have proven to be reliable as indicators of hand strength. The action also has to be distinct in some way, and not part of the player's usual routine. 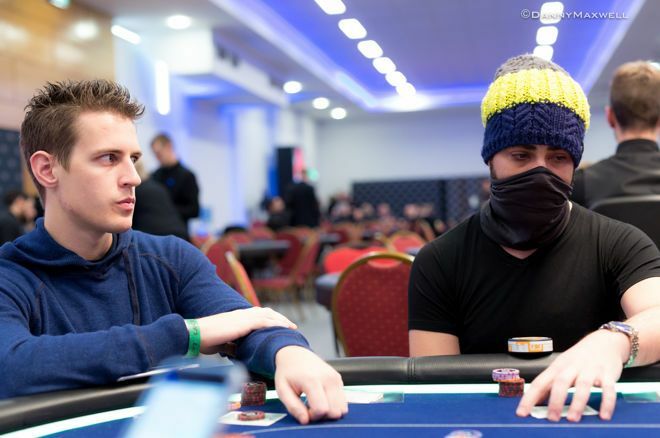 Some players — like Mike McDonald, pictured above on the left with the tell-hiding Orpen Kisacikoglu — will always stare right at you, or will always look down at their chips or community cards as hands play out. For those players, you probably won't be able to use eye contact or the lack thereof as any sort of tell. Sometimes players who are otherwise very good at hiding tells will give away a lot of information simply by varying the amount of time they take to act according to their hand strength. These "timing tells" tend to work a little bit differently given the situation and the action the player ultimately makes. Players who take extra time before checking often really are thinking through a decision between betting or checking, an indication they "have something" — perhaps a medium-strength hand or even a strong hand, or a draw and they are considering semi-bluffing. Meanwhile those who check quickly often really are weak. Calling bets quickly often also indicates relative weakness, although not complete air. Such players making quick calls after the flop frequently have drawing hands or middle- or bottom-pair type hands with which they don't want to bloat the pot. On the other hand, taking some time before making a call is less clear-cut as a tell — sometimes these players will also have medium-strength hands or be on a draw, something you already probably suspect simply because they are calling and not raising. Finally, players who bet quickly are usually thought to be on the weak side, the rapid action intended to seem intimidiating and encourage a fold. Players who take their time before betting are generally stronger, in part because they have to think about how much they want to bet to elicit a call and extract value. "When playing hands, watch their hands" is an easy-to-remember phrase reminding you to look at how opponents are handling either their chips or their cards while they play. How a player handles chips can also occasionally give away hand strength. Some with strong hands will grab chips well before the action reaches them, indicating a desire to bet, while players with weak hands will leave their stacks untouched. Occasionally you'll encounter players doing the opposite of this — grabbing chips in postflop situations in order to give the impression they want to bet, but only doing so in order to discourage you from betting because their hands are in fact weak. Before the flop, many players will signal their intention to fold well before the action reaches them by holding their cards rather than leaving them face down on the felt. Sometimes they'll be obvious about it, readying to muck as soon as it's their turn. If they use a card protector, they might neglect to place it on their cards when they intend to fold. This tell can even happen in multi-way pots postflop as well. The key, as always, is to look for a pattern in the behavior so as to make it a more reliable indicator of what the player is going to do. In this era of smartphones and tablets, many players bring distractions with them right to the table. Especially before the flop, when everyone is still technically in the hand, you might take a look around to gauge the level of interest players are exhibiting and whether or not they are finding scrolling through Twitter or checking Facebook more interesting than the cards they have been dealt. Like the players holding their cards aloft in a folding position, these players may well be less likely to get involved. Even after the flop, some players will betray their lack of interest in the proceedings in other ways, seemingly more intent on flagging down a waiter or following the game on a nearby television screen than paying close attention to the action in the hand. While recognizing a player's level of attentiveness may not necessarily be a good indicator of that player's specific hand strength in that particular hand, it can often tell you something more generally useful about the player's skill level. If someone isn't paying attention at the table, that player is missing out on all of that information that you, the attentive player, are constantly gathering. Such players operate at a disadvantage, often without even realizing it, and might be worth targeting. Talking at the table covers a huge category of potential tells. Indeed, PokerNews strategy contributor Zachary Elwood has written an entire book on the subject of Verbal Poker Tells. We'll limit ourselves to three short points about verbal tells here. One is the general observation that a player who is talking during a hand is often conveying how relaxed he or she is, which is usually interpreted as the player having a strong hand. This is especially notable if the player isn't normally talkative. Again, such a strategy can be used as a "false tell" with a player who is weak chatting away as though to give the impression of strength. Secondly and more specifically, players will often make what Elwood describes as "disclaimers" or statements that are usually in direct opposition to their actual hand strength. An example would be a player exhaling and saying "Well, I guess I have to play this hand" or something similar before calling or betting — kind of the verbal equivalent of a shrug. Often this is an attempt at appearing weak when the player is actually strong. Finally, be aware that when players talk somewhat specifically about their hands, they are very often more likely to be telling the truth than to be outright lying. This isn't always the case, and some players are very skilled at being verbally deceptive. But you'll often find most players are more comfortable saying what is true than what is not — so when they start talking about their hands, listen up! These five types of tells all come from live poker, although you should know that tells can sometimes be worth seeking out when playing online poker, too. For some examples, see Nathan Williams' article from earlier this week titled "7 Ways to Get Better Reads When Playing Online Poker." As we noted at the beginning, some players give off tells unwittingly, but there are also players who will deliberately "act" at the table in an effort to deceive opponents with "false tells." That means with all of the tells discussed above, you might encounter players exhibiting the tell in an effort to indicate the opposite of what it normally might signify. For instance, a player might hold his cards in a way that makes it look like he's about to fold, encouraging you to bet, but then stay in the hand and put in a raise. Also, take heed of that point about looking for patterns first before jumping to conclusions about an apparent tell. Have you seen the player making eye contact on multiple occasions, then showing strong hands each time? That might make the eye contact tell more reliable the next time you see it. But if there's no pattern against which to compare the action, be careful not to overvalue the tell. Finally, especially for new players, it's probably much better to pay attention to betting patterns than behavioral ones — those tend to be much more dependable indicators of players' relative hand strength. Ready to take a seat at the table? Put these hold'em tips into practice at 888poker.